After the financial crisis of 2008, unemployment, poverty and homelessness in Barcelona, as in the rest of Spain, soared. 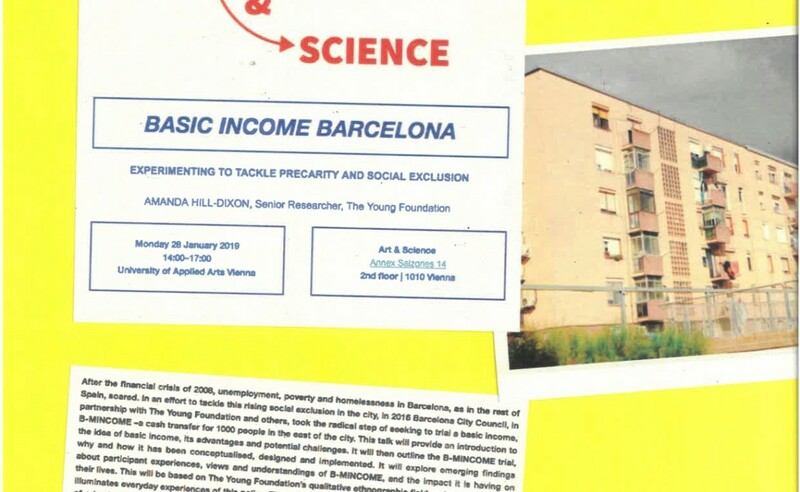 In an effort to tackle this rising social exclusion in the city, in 2016 Barcelona City Council, in partnership with The Young Foundation and others, took the radical step of seeking to trial a basic income, B-MINCOME –a cash transfer for 1000 people in the east of the city. This talk will provide an introduction to the idea of basic income, its advantages and potential challenges. It will then outline the B-MINCOME trial, why and how it has been conceptualised, designed and implemented. It will explore emerging findings about participant experiences, views and understandings of B-MINCOME, and the impact it is having on their lives. This will be based on The Young Foundation’s qualitative ethnographic fieldwork and data which illuminates everyday experiences of this policy. Throughout we will reflect on how the theory and ambitions of a basic income trial have been translated into a practical intervention and where divergences between the theory and practice have emerged. There will be opportunities for discussion throughout. The design and creation of a Community Wellbeing Index which is the UK’s first measure of community wellbeing at a neighbourhood level. Community research for Putting Health into Place, a guide for creating healthy new places created in partnership with the National Health Service and Public Health England. B-MINCOME research in Barcelona, a two-year ethnographic and participatory study of participant experiences of a radical basic income trial in the East of the city. Amanda has an MSc in Social Policy Research from the London School of Economics, a PGCE in secondary (history) education from University College London Institute of Education, and a BA (Hons) in History from the University of Cambridge. THE YOUNG FOUNDATION is an Independent Research Organisation, social investor and community development practitioner based in the UK. In the context of exploring questions related to the future of work and what ‘a good life’ could mean through our 'Artscience practises’ seminar this year. Currently we experience the promise of jobs as a powerful actor (whether its through the threat of cuts due to automatisation, immigration, urbanisation etc or as justification to give tax-breaks). Through lectures, workshops and excursions we want to use the winter and summer semester to speculate on what work could be and how it could frame our sense of fulfilment if moral implications and definitions are changing.